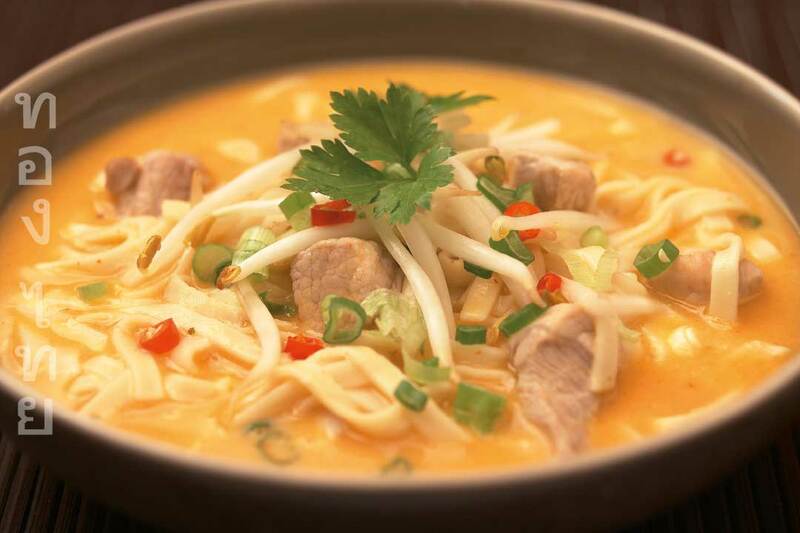 Laksa is a coconut milk noodle soup from the south of Thailand, a wonderful light and quick meal for an Irish day. 3 stalks spring onion, finely chopped. Cook the noodles by placing in hot water for about 5 to 10 minutes, rinse with cold water when cooked if you are not going to use immediately. Fry laksa paste with 1 tablespoon oil. Add the meat and cook for 5 minutes. Add the coconut milk and stir for a minute. Add the sugar, fish sauce and 200ml water. Cook for five minutes, stirring frequently. Place the noodles into bowls and pour the soup over them. Garnish with bean sprouts, spring onion and coriander. Serve, if you haven’t got the hang of chopsticks use a spoon and fork. Tip: Not hot, the Thais add both fresh and dried chili to spice up a Laksa. Variation: You can try this with any meat, seafood or tofu. Add meat at Step 4 or seafood for a little less time.